What on earth is THE MARVELOUS PIGNESS OF PIGS? It's an inspiring call to action for people of faith . . . a heartfelt plea to heed the Bible's guidance . . . . It's an important and thought-provoking explanation of how by simply appreciating the marvelous pigness of pigs, we are celebrating the Glory of God. 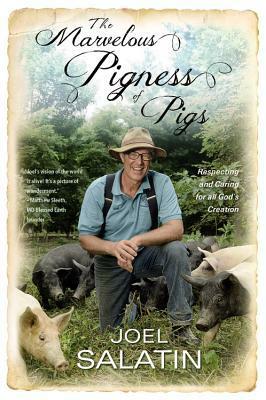 The example that inspires the book's title explains what Salatin means: when huge corporate farms confine pigs in cramped and dark pens, inject them with antibiotics and feed them herbicide-saturated food simply to increase profits, they are not respecting them as a creation of God or allowing them to express even their most rudimentary uniqueness - that special role that is part of His design. Every living organism has a God-given uniqueness to its life that must be honored and respected, and too often that is not happening today. Salatin shows us the long overlooked ethics and instructions in the Bible for how to eat, how to shop, how to think about how we farm and feed the world. Through scripture and Biblical stories, he shows us why it's more vital than ever to look to the good book rather than corporate America when feeding the country and your family. Salatin makes a compelling case for Christian stewardship of the earth and how it relates to every action we take regarding our food. He also opens our eyes to a common misconception many Christians may have about environmentalism: it's not a bad thing, and definitely not just the province of secular liberals; it's really a very good thing, part of heeding God's Word. This book is very eye- opening and interesting. Since I love pigs, I was interested in the book for that reason, but what got my attention more was when the author started to talk about how we need to care for our bodies, and what we eat. While food is super important, so is taking care of creation. I often don't think of the two going hand in hand, but they do. I found it extremely interesting how he goes in depth about the chemical side of plants being sprayed and the earth. I also found it interesting about how Joel goes into the details of what everything means. You don't have to be an expert to find this book interesting on the food side of things or on how creation needs to be cared for. This book was very interesting, but I can also see how a person would take this too far and go to the extreme, so I think careful balance is necessary as well. Overall, I give this book 4.5/5 stars. Thank you to Faith Words for sending me a copy for my honest opinion. A favorable review was not required. 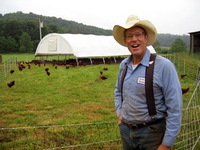 Joel is a nationally renowned speaker on organic farming and "relationship marketing." He is on a mission to develop emotionally, economically and environmentally enhanced agricultural enterprises, and facilitate their duplication around the world. Part of that goal is to produce the best food in the world. Joel espouses an agricultural paradigm shift that sees plants and animals as partners rather than units of production. "Let the plants and animals fill their natural niche with full distinctive expression. The starting point for animal husbandry is to let the animal express its uniqueness." Good review, but not my taste.